A nightmare of workplace. A sign leads the way to success. Computer generated. Serial entrepreneur and small business expert David Weatherholt is the host of Getting Down to Business®, a radio talk show focused on the small business. Recently he interviewed Aaron Bolshaw, Act-On’s Group Manager of Database Marketing, about the fine art of lead nurturing. This blog post is an edited transcript of their conversation. DAVID: Welcome back. We’re going to be talking lead generation a little bit, but we’re going to focus on nurturing, how to turn a lead into dollars and cents – that’s where it becomes the lifeblood of the business. Aaron, I appreciate you taking your time today to talk to us. This is an important topic to every business. AARON: Thanks for having me aboard. DAVID: Lead nurturing sometimes gets confused with generating leads. In the past, I had a business where I was the primary sales rep, and I worked as a sales rep for other companies. I’m old school; we’d go out and make cold calls, trying to identify and generate leads. I used to refer to it as “getting my teeth kicked in.” Nowadays we don’t necessarily have to do that. AARON: I think a lot of sales people and small business owners in your audience very much relate to that. I’ve been there myself too, being on the sales side in my past as well. In a situation where you’re going in and “getting your teeth kicked in,” that person may not be a lead – they may or may not know you, or want to know you. A lead is, first, somebody who really does know who you are. That’s where it starts. There’s obviously going to be varying degrees of how qualified a lead is, especially when it comes to pulling that sales function into the picture. DAVID: The cold call process is one way of winnowing that down – it becomes a real numbers game. The more people you talk to, the more people you can eliminate. [LAUGHTER] It was a tough process. AARON: But it worked. You generated leads. And through that process, didn’t you eventually get somebody interested in your product, and you maybe did a demo or showed them how it could benefit their business? And then ultimately you sold some people that way. Am I wrong? DAVID: I made a living, so it must have been effective. My kids had shoes and I never missed any meals. [LAUGHTER] You’re saying is a lead is somebody that knows or is aware of your company, and has a need for that service. That’s what I call a really qualified lead. But that’s just where we’re starting from. How you convert that lead into a sale, that’s a whole ‘nother process, isn’t it? AARON: That’s when we start talking about that lead nurture process. What are the steps that lead takes before purchasing your goods or service? You can develop a good map of what that looks like, and then nurture those leads to naturally pull them through that sales cycle, or what they look at it as their buyer’s journey. It’s not a sale to them. They’re just buying something and they’re going to go through a process, make a journey, to do that. Helping them along that journey is nurturing. This happens after that lead is created, after you’ve got somebody that knows who you are and they’re interested. DAVID: Here’s a difficulty I used to have: I could qualify a lead, get somebody I knew had a need, but they may not have needed it right at that moment. So it’s necessary to figure out the way of staying in touch or nurturing them, I guess you’re calling it “touching.” I saw someplace where it takes 10 touches to convert a lead into a sale. It also depends on how long a particular sales cycle is. Think about someone purchasing a Boeing 747. Their buying time is probably I don’t know, three years maybe, longer? DAVID: I want to say 10 years. AARON: And some other companies can have a shorter cycle, maybe three months or so. You’ve got to take that into consideration. But you can’t just call them up and if they don’t buy, you don’t call them back. You have to nurture them, do some sort of programmatic approach to keep their interest level high. DAVID: So in sales parlance, you’re “touching” them. Staying in touch. Every morning I get up, turn on my computer, and go through all of my emails. It’s just delete, delete, delete, oh keep that one, delete, delete, delete. I’ve put out a newsletter and I’ve had people at different networking events come up to me and say, “You’re the guy that puts out the newsletter.” I really appreciate that. I’ve found that’s a pretty good way of touching. But is email overused or underused? AARON: I think it depends on what kind of email you’re getting. I do the same thing. I’m guilty as charged. I am an email marketer by trade; I also get those emails and go delete, delete, delete. The problem, the disconnect, is that I don’t know those people, and they haven’t shown me any value. We’re all far too busy to take the time to investigate everything. So marketers can rely on those nurture touch points, those things that really add value to our day, rather than just keeping top of mind. I’ll give you an example. We were at a live event in Atlanta. People who came by our booth could register to win a really nice Pebble Smart Watch. Once they enter their information, we know that they’ve stopped by our booth, they’ve had a conversation with our staff. Automatically, without anybody having to touch anything, the system sent them an email later in the day that said, “Here are some things happening in Atlanta tonight. If you don’t have any plans, check these things out, they’re highly rated, here are Yelp reviews on places to eat or places to go have fun.” That kind of value isn’t necessarily connecting with our business, but it’s connecting us with that person. And that’s really important. DAVID: So they’re going to remember Aaron Bolshaw with Act-On, the guy who gave them a great lead on dinner. AARON: Yes. It’s not always about defining value in the business prospect sense, but how you can help a person. DAVID: That’s a key point, thinking in terms of nurturing and helping that person. ‘Cause if you say buy, buy, buy all the time, they’ll be turned off after the first one. DAVID: Aaron, does nurturing really turn leads into revenue? But for marketers, if you are capturing leads and nurturing leads, you’re going to get to that conversion and be able to say, “I know what kind of leads and what kind of marketing activities are providing the best return for our dollars.” And hands down, we’re absolutely still seeing that email marketing, when done properly, still provides the number one ROI for marketing activities. DAVID: I think we can compare email and direct mail. I do the same thing with my mailbox: delete, delete, delete. But they do work, right? AARON: It’s a part of the whole. It’s a part of that nurturing process. I’m certainly not suggesting that email is the only way to nurture. We do nurturing a variety of ways. We invite our own leads, those I would call not ready for sales, to online presentations. They know who we are, but they’re not in a buying state yet, so we’re going to invite them to online presentations – about how to get better at specific activities – that really help them. We also look at what they’ve done in their online behavior to suggest other possible activities to nurture them with. Of course email is a huge, huge win for us, always has been. But we also provide direct mail. We want to get something on the desktop of that business owner or that sales and marketing professional. DAVID: If you’re touching somebody seven to 13 times, that’s generally over a period of time. If you touch them 13 times, and they actually buy, that could be several months. You may forget [LAUGHTER] how that started out. AARON: Sales works best when they’re able to focus on one conversation at a time. You don’t want to put a lot of tasks on a salesperson, you don’t want them to have to remember all of these touches and where they are in the process. At Act-On we lean very heavily on technology to help with that. That’s our DNA. It helps sales understand where the lead is in the journey, and see the behavior that lead is showing. DAVID: From a sales aspect, you need to be able to manage that whole process. If you’ve been through the process a number of times, it may become automatic. But if you haven’t been through it before, it’s not automatic. So in either case you’ve got to pay attention, right? AARON: Any good salesperson will take a somewhat interested lead and actually nurture it themselves, with conversations. That’s got to happen along with the emails that are going out. It’s going to show the right time for a salesperson to make that close. You don’t want to close too early, you certainly don’t want to close too late. DAVID: We’re getting back to sales 101 here, aren’t we? AARON: Yes, but alongside of sales can be this nurturing process that they don’t have to manage. That’s where the point of marketing automation really comes in, which is you can have these activities that go on in sync with your sales team’s activities that help to provide value in that sales cycle – and before the sales cycle even becomes active. Essentially the marketer is saying, “This person is somewhat interested in our product, let’s get them more interested.” The marketer nurtures that lead to the point where we can give it over to sales. DAVID: If you’re going to touch somebody 13 times, you really need to know that “the last time I touched them we did this, got this kind of response.” Am I barking up the right tree here? AARON: Oh absolutely. It’s more than execution; a lot of these nurturing steps are tactical. Understanding who you’re targeting is very, very fundamental. If you talk to CFOs a lot in your sales cycle, you need to have content ready to specifically nurture a CFO. 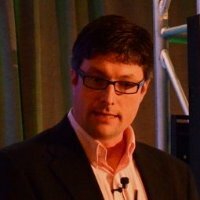 You need to consider how you can pull that CFO from “I’m kind of interested” to “I have a pain digitally” all the way through to “I have a real need for a product now.” That’s the strategy side – having something laid out between those 7 and 13 steps so you’re not just making something up on the fly. DAVID: I think some salespeople, again this is old school stuff, were proud of flying by the seat of their pants. AARON: But sales is really good at that. They’re able to because they’re having a live discussion with a prospect, to understand exactly how qualified they are. I’m sure you’ve talked maybe on this program about BANT: the budget, authority, need, timeline, qualification. The rep can decipher that quickly in a phone call. The salesperson’s job is to get off the phone, and they want to do it with a positive result – a sale. But if they can’t get a positive result, they’ve got to get a continuance. What we’re talking about is making sure that outside of that live discussion, you’re able to understand who someone is and where they are in the buying process. That’s where behavior data really kicks in and is an extremely important part of marketing automation. DAVID: I take that as, “We’re not really interested and I can’t tell you no. But I’ll string you along.” But sometimes that could be the truth, correct? AARON: It might not be that perfect time. But after they give you that polite answer, “Not now, call me next quarter or call me next year,” then we begin that nurture process again. We make sure that we’re staying in touch with them without taking a lot (or any) of sales’ precious time, because that’s a more expensive resource. We keep in touch with the lead in a cadence that really meets and matches what they’re looking for. Staying top of mind in these digital channels is important. Because 70 percent of people who are going to say no to you right now will go on to purchase within the next 12 months. Are they coming to you? DAVID: I’m old school. I remember having 3×5 cards on leads and making little comments as I contacted them. It wasn’t easily managed. Does marketing automation help you manage this whole process? AARON: That’s the next step. When you start putting all of the things in place it takes to do effective lead nurturing, so that you’re really focused on the right thing, which is revenue, it becomes pretty complex. Marketing automation really helps businesses guide a prospect, do that nurturing, guide that prospect through a full “lead to revenue” cycle, and makes it much easier. It’s all in one place. You can manage your campaigns and all your reporting through one platform. I think that’s really why this technology space has continued to flourish. It actually provides very real, very reportable business results such as revenue increase, sales velocity increase. This really helps small businesses grow faster. DAVID: I noticed an ROI calculator on your website. In old-school sales we used to look at what’s the average sale price, and how many contacts you need to make a sale. All of that is contained in this calculator. AARON: We wanted to make it very simple for people with rudimentary metrics, because not everybody knows the four components that we’re asking for on the ROI calculator. We wanted to make sure they understood the results they could expect to see using marketing automation. 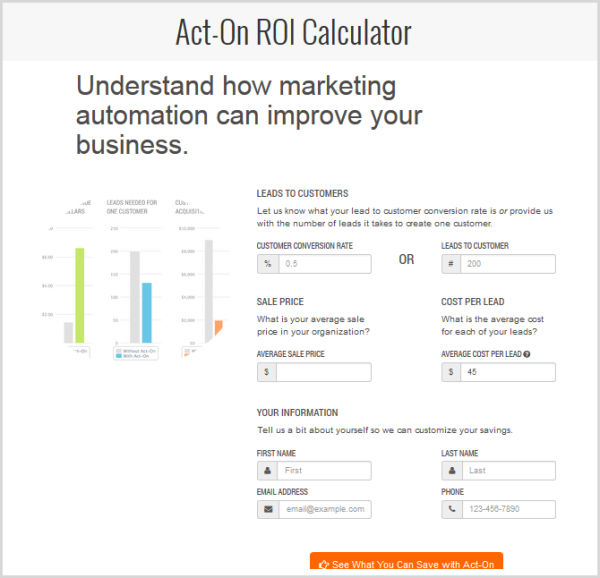 Take a look and see what the ROI of marketing automation could be for you. If nothing else, it’s a fun little graphic, and you can learn about some of the numbers that really drive this market. AARON: That’s the easiest way to get that ASP. DAVID: I know that if you have a retail store you could have items costing from a dollar to $1,200. Your average ticket is going to come out somehow, by taking your total sales and divide it by the total transactions. It always amazes me, the number of clients that I’ve dealt with that don’t know what that is. AARON: Some people are so busy working that they rarely have that moment to sit back and consider how things are going. It’s not uncommon that business owners lack critical key performance metrics like this. But understanding some of these things is critical to future growth. DAVID: I’ve run small businesses; I know it’s enormous pressure. It may sound daunting to calculate the average cost. That’s basic stuff, but that’s what it takes. AARON: I’ve never talked with anybody that said, “Nope, we’ve got our market covered, we are the gorilla in the room and we don’t have to fight for sales at all.” That just doesn’t happen. A lot of marketing is finding some unique ways to stand out. But more and more it’s about making sure that you manage that journey that a buyer takes before they hand over that check or sign that contract. Make sure it’s done right and it’s pulling them towards the result that they should expect when they get engaged with your business. DAVID: Aaron, we’re about out of time. We appreciate you taking your time today to share with us. AARON: David, it was a pleasure. 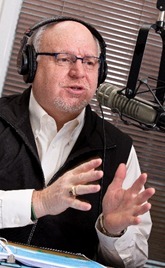 Getting Down to Business® with David Weatherholt is Business Talk Radio, focused on small businesses. Every program features interviews with special guests who are small business owners, experts, authors, entrepreneurs, or product/service providers. David likes to say: “Not every business start-up is wildly successful, but every start-up is rich in lessons. Get the advantage of these lessons – minus the hard knocks!” Tune in to hear Getting Down to Business on KOAN and KVNT in Alaska or KSBN in Spokane, Washington; or get the podcasts.